To incorporate graphene into composites, the graphene must be dispersed/exfoliated as single nano-sheets uniformly into the formulation. The higher the grade of deagglomeration, the better the extraordinary material properties are exploited. Ultrasonic dispersion enables for a superior particle distribution and dispersion stability – even when formulating at high concentrations and viscosities. Ultrasonic processing of graphene gives outstanding dispersion qualities and excels conventional mixing methods by far. In order to lend composites the outstanding material characteristics of graphene such as strength, graphene must be dispersed into a matrix or applied as a thin-film coating onto a substrate. Agglomeration, sedimentation, and the dispersion into a matrix (or particle distribution on the substrate, respectively) are important factors that influence the resulting material’s properties. Due to its hydrophobic nature, the preparation of a stable and highly concentrated graphene dispersion without surfactants or dispersants is a challenging task. To overcome the van der Waals forces, strong shear forces generated by ultrasonic cavitation are the most sophisticated method to prepare stable dispersions. Graphene with a high electric conductivity (712 S·m-1), good dispersity and high concentration can be easily prepared using an ultrasonic disperser, such as UIP2000hdT or UIP4000. Sonication allows to prepare a stable graphene dispersion at low process temperature of approx. 65°C. Since the process parameters of sonication can be precisely controlled, ultrasonic dispersion technology avoids damages of the chemical and crystal structures of graphene – resulting in pristine, defect-free graphene flakes. 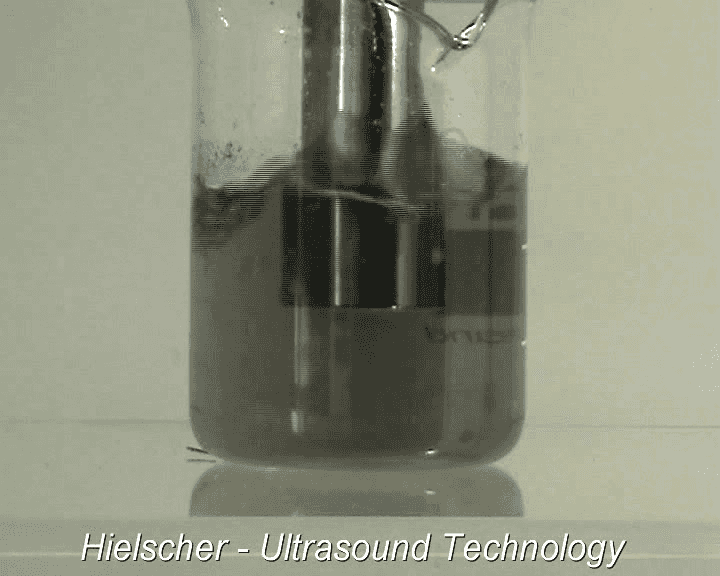 Hielscher’s powerful ultrasonic systems are capable to process graphene and graphite in large volumes, e.g. for liquid-phase exfoliation and graphene dispersion. The exact control over the process parameters allow for the seamless scale-up of ultrasonic processes from bench-top to full-commercial production. Ultrasonically exfoliated few-layer graphene with approx. 3-4 layers and an approx. size of 1μm can be (re-)dispersed at concentrations of at least 63 mg/mL. Hielscher Ultrasonics offers high-power ultrasonic systems for the exfoliation and dispersion of bulk-layered graphene and graphite into mono-, bi- and few-layered graphene. Reliable ultrasonic processors and sophisticated reactors deliver the required power, process conditions as well as precise control, so that the ultrasonic process results can be tuned exactly to the desired process goals. One of the most important process parameters is the ultrasonic amplitude (the vibrational displacement at the ultrasonic horn). Hielscher’s industrial ultrasonic systems are built to deliver very high amplitudes. Amplitudes of up to 200µm can be easily continuously run in 24/7 operation. For even higher amplitudes, Hielscher offers customized ultrasonic probes. All our ultrasonic processors can be exactly adjusted to the required process conditions and easily monitored via the built-in software. This ensures highest reliability, consistent quality and reproducible results. The robustness of Hielscher’s ultrasonic equipment allows for 24/7 operation at heavy duty and in demanding environments. 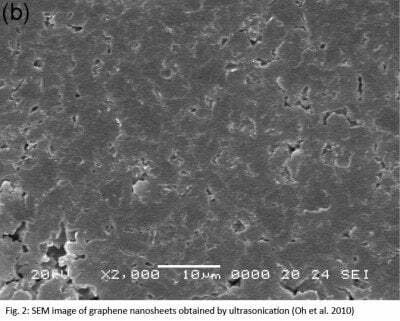 This makes sonication the preferred production technology for the large-scale preparation of mono- and few-layered graphene nanosheets. Offering a wide product range of ultrasonicators and accessories (such as sonotrodes and reactors with various sizes and geometries), the most suitable reaction conditions and factors (e.g. reagents, ultrasonic energy input per volume, pressure, temperature, flow rate etc.) can be chosen in order to obtain the highest quality. 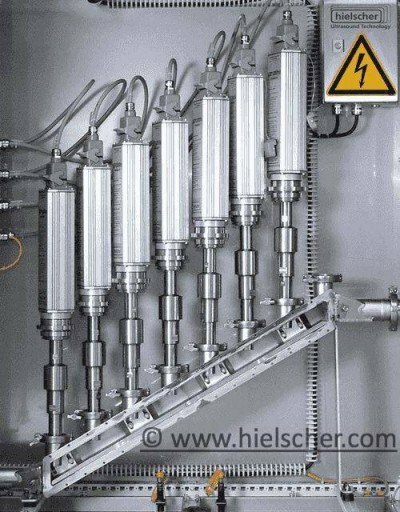 Since our ultrasonic reactors can be pressurized up to several hundred barg, the sonication of highly viscous pastes with to 250,000 centipoise is no problem for Hielscher’s ultrasonic systems. Due to these factors, ultrasonic delamination / exfoliation and dispersing excels the conventional grinding and milling techniques. 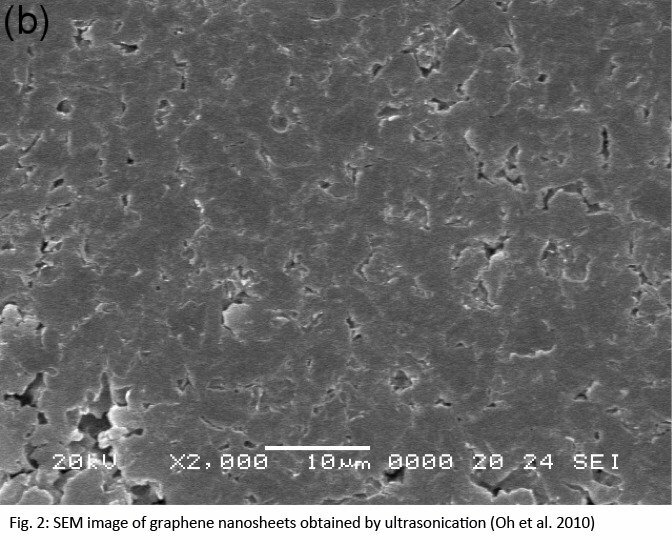 Ivanov R., Hussainova I., Aghayan M., Petrov M. (2014): Graphene Coated Alumina Nanofibres as Zirconia Reinforcement. 9th International DAAAM Baltic Conference of industrial Engineering 24-26 April 2014, Tallinn, Estonia. Graphene is a one-atom-thick layer of carbon, which can be described as a single-layer or 2D structure of graphene (single layer graphene = SLG). Graphene has an extraordinarily large specific surface area and superior mechanical properties (Young’s modulus of 1 TPa and intrinsic strength of 130 GPa), offers great electronic and thermal conductivity, charge carrier mobility, transparency, and is impermeable to gases. Due to these material characteristics, graphene is used as reinforcing additive to give composites its strength, conductivity, etc. In order to combine the characteristics of graphene with other materials, graphene must be dispersed into the compound or is applied as a thin-film coating onto a substrate. Common solvents, which are often used as liquid phase to disperse graphene nanosheets, include Dimethyl sulfoxide (DMSO) , N,N-dimethylformamide (DMF), N-methyl-2-pyrrolidone (NMP), Tetramethylurea (TMU, Tetrahydrofuran (THF), propylene carbonateacetone (PC), ethanol, and formamide. Graphene is with a thickness of one atom the thinnest, with a weight of approx. 0.77 mg per 1m2 the lightest, and with a tensile stiffness of 150,000,000 psi (100-300 times stronger than steel) and a tensile strength of 130,000,000,000 Pascals the strongest material known. Furthermore, graphene is the best thermal conductor (at room temperature with (4.84±0.44) × 103 to (5.30±0.48) × 103 W·m-11·K-1) and the best electric conductor (electron mobility higher as 15,000 cm2·V-1·s-1). Another important characteristics of graphene is its optical property with a light absorption at πα≈2.3% of white light, and its transparent appearance. Hielscher’s powerful ultrasonic processors deliver the required high shear forces to overcome van der Waals forces in order to distribute graphene nanosheets uniformly into composite matrices. Ultrasonic dispersers such as the UIP2000hdT or UIP16000 are used to produce graphene- and graphene oxide-reinforced nano-composites.